We stayed 1 night at Strand End House B&B. We liked very much Joane's hospitality. She provided us with all the information we needed for our stay and also for visiting the area. The breakfast was good. Our room was on the ground floor and comfortable. I highly recommend this B & B The house and rooms are neat, clean and well-appointed. The breakfast is very good. Joan and Eamonn are the perfect hosts. Always very friendly and helpful. Thanks for some good days. Dieses B&B ist absolut empfehlenswert. Das Essen war sehr lecker, die Gastgeber freundlich und hilfsbereit, und haben uns sogar ein paar Kilometer auf dem Kerry Way, den wir zu Fuß gemacht haben, gefahren, da wir an diesem Tag starken Regen und Wind hatten. Die Unterkunft ist komfortabel, vom Tee im Kaminzimmer nach der Ankunft, über das schöne und saubere Zimmer, bis zum Frühstück im Dining Room. Wir haben uns sehr wohl gefühlt. Das Haus ist familiär geführt. Die Gastgeber sind sehr freundlich. Wir hatten ein schönes, geräumiges und sauberes Zimmer. Das Frühstück war sehr gut und reichhaltig. Wir können Strand End House B & B nur weiterempfehlen. Lovely stay with Joan - she met our every need, served a great breakfast, and gave us lots of info on the area. Wold definitely recommend to friends and family. Fantastic B&B! The B&B is located slightly too far out of Cahersiveen to walk to the nearest pub - and that's the only negative aspect I can think of. The whole house is clean and modern. Room and bathroom were spacious with a very pleasant interior. The bed was very comfortable and we slept very well. The hosts were extremely friendly and helpful and served a fantastic breakfast with freshly-prepared fruit salad. There are enough parking lots. The town, beaches and a spectacular castle-ruin are not too far away. And besides - the price is unbeatable! Breakfast is excellent, delicious. Very neat rooms plus shower and toilet. Owners are very friendly and helpful. We had a wonderful time. Lovely owners and accommodations. We arrived late, but were greeted warmly with tea and conversation. Our breakfast was the best we had while in Ireland and that fresh fruit salad was tres manifique! Best B&B ever! So nice people and very clean and nice rooms.We even got tea and cake, when we arrived. So amazing! We had a great time at Strand End House. Joan and Eamon go out of their way to make their guests feel comfortable and spoiled. They are very helpful if one needs advice for outings and nice beaches. The breakfast is abundant and tasty. Some of the rooms are a bit small, but guests are invited to use a living room and a sun room, as well as the terrace. No sea view, but that seems like a minor flaw considering everything else this B&B has got. Definitely recommendable. We stayed with Eomonn and Joan for one night in March 2013 after driving around the Ring of Kerry. There had been a mix up with our arrival times and at one point we thought we may have had to cancel 4hrs before our stated arrival time. We had booked on www.bookings.com and were worried that it would mean that we still have to pay for our nights accommodation if we cancelled. When we called Joan though she told us not to worry and that she would cancel the booking and then contact www.bookings.com and tell them not to charge us. As it transpired however we ended up staying there though and we loved it. The house is charming and very well kept. The room we stayed in looked recently refurbished with brand new finishes. The bed was very comfortable and linen crisp and fresh. The bathroom was modern and new and the showers were steaming hot. The next morning we had the most delightful breakfast I've had at just about any B&B I have ever stayed at. Home made bread with fresh jam, eggs, cereal, freshly squeezed orange juice and more while Eomonn sat with us happily shared his extensive knowledge of the region and Ireland as a whole with us. It was really lovely. We were very very happy with our time at Strand's End House and would have given them this review regardless however to top it all off when we left we forgot our external hard disk drive with just about my girlfriend's entire life on it in the room. By the time we realised we were in Galway and were leaving the country in 2days. When we checked our email we saw that Joan had contacted us saying that she had found it and would be happy to send it to us at her own expense. When we arrived home, it was there waiting for us in the mail. I would recommend Strand's End House to anyone passing through the region. It's a lovely part of the world and this is a lovely B&B with lovely owners. You will not regret a stay there. Breakfast was excellent and service was great! This B&B was the best we went in our 2 weeks trip, and it was the cheapest. 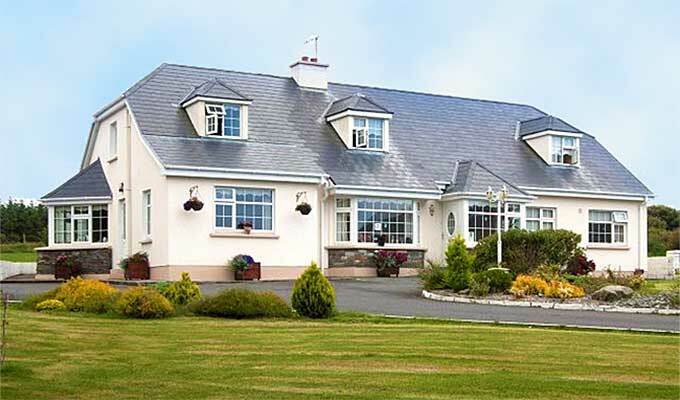 The hosts are very friendly and helpful, and the Cahersiveen area is so beautiful! Don't go in Ireland without going there!